“O.K., onto my favorite subject”… that’s what most of us say when we’re talking about snowmobiling. Those were the first words Charlene Whitaker said when we started this interview for our story. Knowing this lady, and knowing what she’s done for snowmobiling on a personal and professional level, one might say that little phrase would be an understatement. In 1968, Charlene, then a registered nurse, took some time off to be with her children and husband Whitey, to be an at-home-mom. Up to this point, she had never ridden a snowmobile. She was an avid skier and part of the National Ski Patrol, but hadn’t been on a sled. “I got bored,” she said, “I called Sno*Jet and landed a dealership.” With 5 sleds and $1,000 in inventory, Whitaker’s Sales and Service opened in Huntington, Mass. With a showroom, clothing on display and a chainsaw dealership, they did well that first year. In fact, by the end of that first year they sold about 15 sleds. The ’69 –’70 season was doing well but Charlene wanted to do something else. She helped organize the Snowgators Snowmobile Club, in which she was president for three years. She also wanted to go racing. “Whitey didn’t want any part of it” she said, so off she went, by herself to a local race in Southwick. On her first time out… she grabbed third place! “That was it, I got bit by the bug, I wanted to go racing.” Go racing she did, and she did quite well on the local circuit running stock sleds. Every weekend, all day Saturday and Sunday, #233 was on the track. Which track? Name one and she was there – Malone, NY; Booneville, NY; Greenville, NY; Wolfsboro, NH; St.Albans, VT; Manchester, VT. You see, once she started winning on the blue T-Jet, Sno*Jet liked what they saw and picked up the tab. She started to compete in bigger races and joined the U.S.S.A., but didn’t consider the little races too small, not at all. She would still go to Lebanon Valley in Southwick, and the likes, for track time and to test and tune. In fact, her average lap time was 75 mph on a 1/4-mile oval. That’s cool, in my opinion! A lot of sleds in that day couldn’t even run that speed in a 1/4-mile stretch! Oh, to be a fly on the wall… of course, I’d be a frozen fly! Anyhow, back to the story. Unfortunately, there was no big payday at Eagle River but the experience and memories were no doubt priceless. Later that winter, Charlene Whitaker did win the Paul Bunyan in Bangor Maine, collecting $1,000 in front of relatives that came down from Presque Isle, her hometown, to see her race. I could clearly see this meant more to her than any other race, even Eagle River. That was her day or was it? While Charlene was setting fire to the competition, the Huntington Fire Department was putting out a blaze at her dealership. SMOKED! All but one sled was lost. The dealership bounced back the next fall and it was business as usual, and so was the racing. Luckily, it was as eventful as the prior years but without the bumps and bruises at the business. Oh, but those do happen on the track. Charlene suffered a broken right foot when she and fellow team-racer, Judy Rinaldi, tangled. Full of spirit and charging-on, she finished the 1972 season in a cast that weighed quite a bit, but it didn’t slow her down. The next season she broke a couple of ribs, but again, you wouldn’t have known it. Charlene was a wife, a mother, a salesman, and bookkeeper, but she was also a racer, and injuries came with the territory. By the end of the 1975-76 season, Sno*Jet was closing their doors. Having been to the World Championship, qualifying for three World Series, placing second in overall points one year, accumulating a truckload of trophies and plaques, Charlene Whitaker hung up the leathers. Racing bib #233 proudly hangs in her snowmobile room. That marked the end of an era but there was still much more to be done. Still working at the dealership, Charlene was invited to speak at snowmobile club meetings and to civic groups, like the Westfield Boys and Girls Club, about safety, speed, and trail use. With the help of Senator Michael Knapik, Representative Don Humason and Representative Steve Kulik – three people she was proud to have been associated with – she could spread the word a lot more effectively. Charlene and Whitey opened, and to present date still help maintain, an 11 mile stretch of trail that runs from Huntington to Worthington. These two sledders are in their 70’s… that takes heart and soul folks. And dedication. Charlene smiles when she proudly reflects on her racing career. She has a lot to smile about, a good marriage of 49 years, three good kids, and a career as an R.N. at Noble Hospital for 28 years, as well as an administrator for the Governor House Nursing Home in Westfield. That’s the professional end of it. On the personal side, she has made a “career” of volunteering. Charlene was the secretary of SAM for three years. 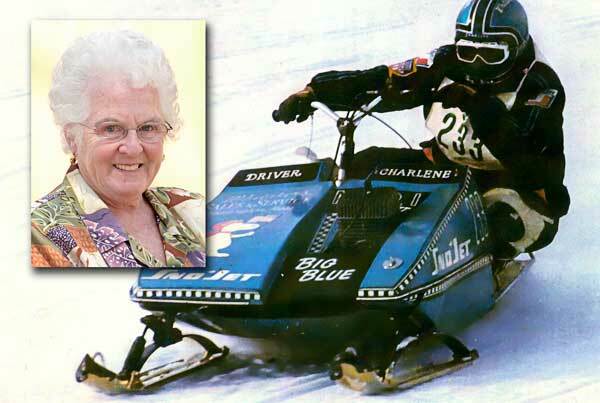 She was also secretary and delegate for the Wothington Snowmobile Club. She and Whitey (who was the trail boss and is often seen riding with a chain saw on his sled) have attended 11 International Snowmobile Congresses, decades of SAM meetings, snowmobile functions, and are always helping out at the Snowmobile Expo. he has also testified at the State House on several safety related and pro-snowmobile bills. Charlene and Whitey still ride, “I have a Polaris 750 4-stroke. What can I say, I like speed.” On nice summer day, you might spot her driving a ’76 Vette, something she bought with her race winnings. Charlene is gracefully stepping down from her appointed positions in the snowmobile world, “I need a little Me Time” she says. So, next time someone says they’re bored, sit back and watch… only once in a great while does something amazing come from it!